Live streaming worship services is all the rage these days. After all, if we can’t get people into the church, why not bring the church to them. That’s what Jesus did, right? There are a lot of good reasons to live stream your service, but whatever the reason the, you must know what you are doing to pull it off. Part of knowing what you’re doing is knowing how to leverage your presentation software in the live stream environment. There are several levels of live streaming. The most basic is opening an app like Facebook or Instagram on your phone and going live. This brings to light the first challenge. Video quality and audio quality. That brings you to the next live streaming evolutionary step. A more professional camera with a shotgun mic on a tripod, connected to a computer or live streaming box that transmits the video and audio to a live streaming provider like sermon.net or livestream. This is much better, but now we need better audio and more cameras; and it would be nice to get the song text, scripture and sermon points to show up on the lower third of the screen so the online audience can see the text better. Now you need a video mixer, two or three cameras, possibly a switcher, a separate audio mix through a secondary audio board and, oh yes, more volunteers to operate all this equipment. EasyWorship can easily fit into the last two streaming environments. Basically, EasyWorship can handle any text, graphics or video playback you want to go to your live stream. While EasyWorship doesn’t do the live stream for you, it can integrate with little or no extra hardware. Let’s go over a couple of specific scenarios where you could plug EasyWorship into your live streaming environment. In this example you have a camera, mic, worship computer and a streaming computer, but want to add graphics with EasyWorship. Connect your camera to your EasyWorship computer using a video capture card or USB 3.0 device. Create a feed in EasyWorship, then add that feed to the scriptures, songs and presentations theme areas. Modify those themes so that the slide content shows up where you want it. Apply the themes you created to the songs, scriptures and presentations you are using for the service. Connect the output of your computer to the streaming computer or streaming box using another video capture device or use EasyWorship’s NDI output to send the content to streaming software like OBS or VMix. In this instance, EasyWorship is handling all the compositing of the video camera with text and graphics. However, you may want to step it up a notch to something more advanced. In this example you have two cameras, two USB 3.0 capture devices, a computer with VMix for streaming and a laptop for EasyWorship content. The cameras are connected to the VMix computer via the USB capture devices, audio is fed in through aux jacks on the VMix computer, and the EasyWorship content computer is sending content to VMix via NDI. In EasyWorship under options, the output is set to NDI instead of a connected projector or TV. The network connection between the EasyWorship and VMix computers is a Gigabit wired connection. VMix will handle compositing EasyWorship content over live video, along with switching cameras as needed. In VMix you’ll setup the inputs for the cameras and the EasyWorship NDI feed. In EasyWorship you’ll create themes that have no background set, but you’ll set text formatting along with location and text box fill and any other graphics you want added. VMix will receive all of these inputs and composite them together to send out to your streaming service. EasyWorship’s NDI output can send alpha channel content to VMix from EasyWorship. This lets you put transparent PNGs on your slides and use transparent .webm videos to add more flare to your online presentation. 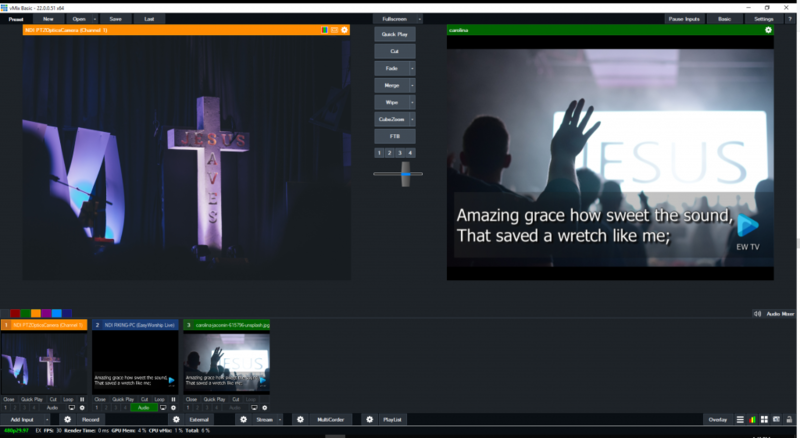 These are only a couple of instances that demonstrate how you can add EasyWorship to your live stream environment to enhance the quality of the presentation that your online audience receives. 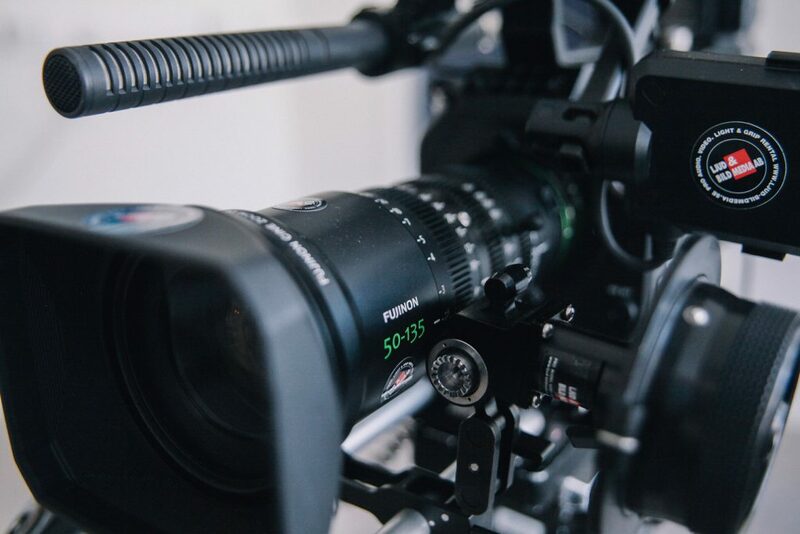 Hopefully, your technical creative juices have already started flowing when it comes to thinking about live streaming.